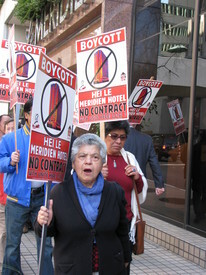 SAN FRANCISCO — Their spirited chants could be heard blocks away as workers at the HEI Meridien hotel picketed their workplace April 1, urging a boycott of the facility until the hotel’s management recognizes their right to a union based on majority sign-up. The action was one in a series of demonstrations at the Meridien since last July, when workers at a number of non-union hotels in California demanded that their respective managements recognize their right to organize when a majority of workers have signed cards for union membership. Workers at the Hyatt Fisherman’s Wharf hotel held a similar picket late last month. Many workers at both hotels have signed a petition to call on management to agree to a card-check neutrality agreement. 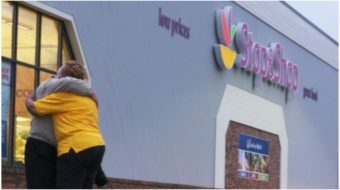 Workers demanding union rights include both those with years of seniority and relative newcomers. Michael Ancheta, who worked at the hotel for 13 months until he was laid off in January, said at first he didn’t know much about the union. But he started going to organizing committee meetings and became convinced he wanted the greater rights, benefits and job security San Francisco’s unionized hotel workers have. Local 2 says both the Global Hyatt Corporation and HEI Le Meridien are among the world’s fastest-growing hotel companies, despite the economic downturn. Similar efforts are underway at other hotels, including the HEI Hilton in Long Beach and the Hyatt Regency Santa Clara in California, and the Hyatt Regency Indianapolis. Students at Brown, Cornell, Notre Dame, Yale and other universities with investments in HEI are calling on their schools to support the workers’ right to organize. Union leaders point out that the Employee Free Choice Act, now before Congress, would let workers choose to decide their union status by majority signup or by secret ballot election, and thus would end prolonged stalemates like those at the two San Francisco hotels. Across the bay, workers at the Concord Holiday Inn are also calling on potential customers to boycott the hotel. There, workers have long been represented by Unite Here Local 2850. But the new owners have been stalling since last May on negotiating a new contract. Workers in all these struggles have strong support from elected officials and community leaders as well as from other unions. In San Francisco the president and members of the Board of Supervisors have stood with the workers. In Concord, the May 25 picket line was joined by Mayor Laura Hoffmeister, county Supervisor Susan Bonilla and representatives of other state and local elected officials as well as the heads of the Contra Costa Labor Council and Building Trades Councils.